Kidney beans are a very good source of cholesterol-lowering fiber, as are most other beans. In addition to lowering cholesterol, kidney beans' high fiber content prevents blood sugar levels from rising too rapidly after a meal, making these beans an especially good choice for individuals with diabetes, insulin resistance or hypoglycemia. When combined with whole grains such as rice, kidney beans provide virtually fat-free high quality protein.(source). They are also a very good source of iron, potassium and magnesium which helps maintain blood pressure within normal range and protects the over-all heart health. Potassium and magnesium dilate the blood vessels and arteries thus assuring smooth blood flow. Soak the rajma in 6 cups water for a good 8-9 hours or overnight. In a heavy bottomed pan heat oil and add cumin seeds, cloves and cinnamon and roast for a few seconds . Add sliced onions and cook stirring occasionally till translucent. Add ginger garlic paste and continue frying till the concoction turns golden brown. Add crushed tomatoes along with red chili powder, turmeric and coriander powder. Cook stirring often till oil separates from the sides of the pan. 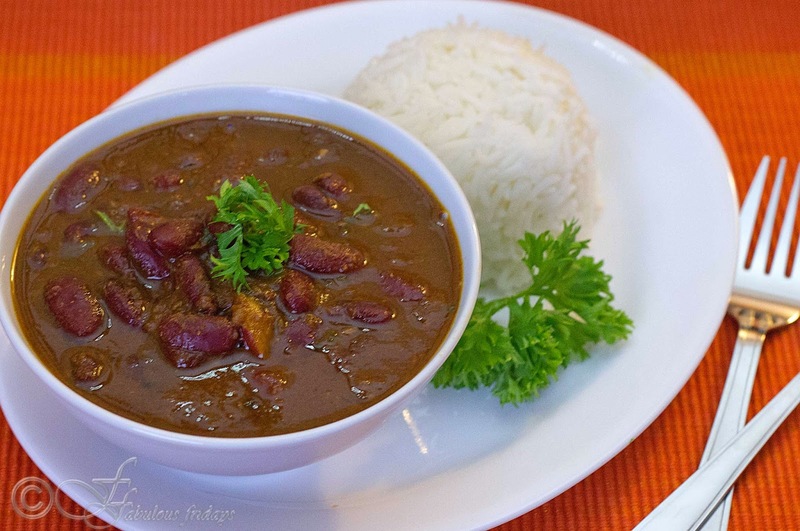 In a pressure cooker, add the soaked rajma along with all the water and the above masala. Add salt to taste, stir well and cover the lid. Pressure cook on high till the first whistle. Simmer and cook for 35-40 minutes further. Let the pressure release on its own before opening the lid. Check for consistency. If its too watery boil it down, if too dry add some boiling water to it. Boil on high for a few minutes till the gravy becomes smooth (the curry should not be watery, it should have a smooth consistency). You can also mash a few rajma with the back of the spoon. this will help in thickening the gravy. Finally, take it off the heat, stir in garam masala and garnish with chopped coriander leaves. Serve hot with plain boiled rice or jeera rice.